The 2011 CMCIG Spring Workshop was held at Wright State University, in the Charles & Renate Frydman Educational Resource Center (ERC). 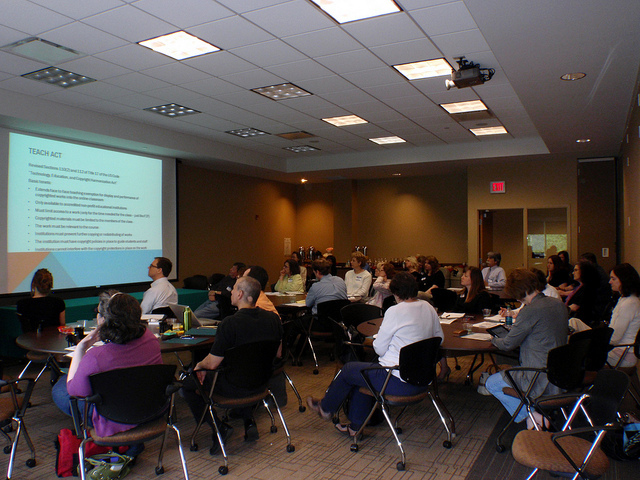 Sixteen attendees listened intently and participated in the workshop, themed “Local Resources and Collaborations”. Stephanie Bange, Director of the ERC, gave an overview of audiobooks, their usefulness in the classroom, audiobook evaluation and awards. She shared some anecdotes about her recent experience as a member of the 2011 Odyssey Award Committee and gave everyone 5 audiobooks to add to their library’s collections. The group headed over to WSU’s Bolinga Center, the home of the Virginia Hamilton & Arnold Adoff Resource Center. There, Dr. Dana Murray Patterson explained the history of the resource center, allowing everyone access to the collection — reference materials, personal readings and books written by Hamilton and Adoff — used by Virginia Hamilton and Arnold Adoff to research information for their books. ThinkTV (Dayton area PBS station) Educational Projects and Services Manager Mary Anne Kirk talked about the free streaming video and teacher instructional materials available on local PBS websites. Such programs as “Our Ohio : Exploring Our Heritage” and “World War II : Exploring Your Local History”, streamed through ThinkTV, were highlighted. Mary Anne said that (hopefully) soon all the streaming programming available through individual PBS stations will be gathered into one umbrella website. A highlight of the tour of the ERC was the 3,000 item collection of the Dayton Holocaust Resource Center, available for loan to Ohio libraries through OhioLINK. In the afternoon, the group gathered at the National Museum of the United States Air Force, where we were given a docent-tour of the permanent exhibit “Prejudice & Memory” by Holocaust survivor Renate Frydman. At the conclusion of the business meeting, attendees were able to wander through the museum at their leisure. On May 13, 2011, the Distance Learning Interest Group (DLIG) hosted its spring workshop, “INOV8: Revitalizing Distance Learning” at Ohio Dominican University. With 41 registrants from 22 institutions, the workshop’s four sessions offered attendees an opportunity to network and discuss current trends in e-learning. Louis Mays opened the workshop with an overview of using Blackboard to connect with dual-enrollment students in Learning Management Systems: Synchronous and Asynchronous Strategies for Remote Users. He was followed by TL; DR: Amp your Audience’s Energy (Without Draining Yours), an interactive presentation focused on keeping an online audience attentive through effective design and visual appeal. Attendees had a choice of which breakout session to attend: Technical Writing with Karen O’Hara; Prezis for Presentations with Eric Resnis & Eli Sullivan, or; Animoto for Videos with Kathleen Pickens-French. After a buffet lunch, the panel for Exceeding Comes Later: Identifying & Understanding Expectations prompted a lively discussion on the role of librarians in an online learning environment. The panelists included: Karen O’Hara, online instructor & Knowledge Base Coordinator; Jessica Long, Public Services Librarian; Katherine Topper, Kent State SLIS student, and; Sarah Garrison, University of Kentucky SLIS student. John Burke closed the workshop with an engaging review of multimedia issues with Audiovisual Conundrums: Legality versus Equality with Media Resources. Many of the resources and materials from the presentations can be found on the DLIG Blog at http://distancelibrarians.wordpress.com. Please visit the blog to join the DLIG listserv, share resources relevant to distance librarianship, or to find collaboration opportunities by volunteering for a DLIG committee. Special thanks to the 2011 Workshop Planning Committee—Meghan Frazer of Kenyon College, Jessica Long of Miami University Middletown, Christina Bonner of Ohio Dominican University, and Kathleen Pickens-French of Miami University Hamilton. On April 21st, the Instruction Interest Group (IIG) hosted their annual workshop on a beautiful spring day at the Ross Auditorium, Franklin University in Columbus. “Thinking outside the Library: Creative Collaboration for Library Instruction” brought together 55 Ohio academic librarians to hear from colleagues who shared their unique, successful approaches to building instruction programs through cross-campus collaboration. Featured sessions included two presentations by teams of instruction librarians and their campus partners, and a best practices panel discussion. The workshop kicked off with a presentation by Franklin University librarians Carmen Byg and Tiffany Hampel who worked with Ryan Brainerd from Franklin’s Interactive Design Services to design an interactive, multimedia tutorial, a “Library Passport.” The impressive “Library Passport” contains library information and research tips, along with course-specific material, including a graded assignment. This project was developed in collaboration with faculty, librarians and course designers. Lauren Wahman, librarian at Raymond Walters College, University of Cincinnati, along with UC English faculty member, Brenda Refaei, and Pam Rankey, from UC’s Office of Information Technology, presented “Collaborative Teaching: A Library and Teaching Faculty Partnership.” This cross-disciplinary partnership developed and team-taught a unique First-Year Experience (FYE) pilot course that targeted non-matriculated students, with the objective of helping undecided or non-matriculated students successfully transition to college. After a break for a well-received stromboli buffet, with espresso bar and lots of interesting conversation, the attendees reconvened to hear from a panel titled Conversations on Collaboration: Strategies for Success. Daron Larson, Instructional Resources Librarian from, Franklin University, moderated the panel of three librarians from a variety of institutions who shared their successful strategies for collaborating with institutional partners to improve their information literacy programs. Panelists Amy Fyn from Bowling Green State University, Eric Resnis from Miami U and Sara Klink from Stark State College each shared how they work with partners on their campuses to respond to the distinct needs of their student populations. The overwhelmingly positive evaluations from the workshop indicate that the workshop was a success and many attendees suggested that our engaging panel moderator, Daron Larson, should host his own T.V. show. Paul Jenkins, Director of Library Services, College of Mt. St. Joseph, and author of Faculty-Librarian Relationships (Oxford: Chandos, 2005) graciously donated a copy of his book as a door prize for the workshop. Thank you, Paul! The workshop was organized by the Instruction IG Planning Committee: Lauren Wahman, Daron Larson, and IIG co-chairs Carmen Byg and Kathryn Venditti. Carmen Byg will be stepping down as co-chair when her term ends in July. Many thanks to Carmen for her leadership over the past two years! We are pleased to welcome Lauren Wahman who will take on the role of IIG co-chair. The items on the IIG’s agenda for the remainder of 2011 are to launch a blog and to sponsor an instruction-related session at the ALAO Annual Conference on November 4, in Toledo. This will be my last time to write for the ALAO newsletter. It has been a pleasure to step in again as co-chair for SSIG. It is definitely a great group of people to work with. If you haven’t signed up to be part of the SSIG Planning Committee please do so. I am sure that you will really enjoy it. As part of the planning committee you plan a spring workshop. SSIG just had their workshop on Friday, May 13. It was, once again, a great event, which was reflected in positive evaluations. The workshop was held at the South Campus of Southern State Community College, with 23 in attendance. Classes were about time management, tech news you can use, mobile apps, web 3.0 and free tools. The food was something to write home about, and we all know how important food is. Everyone was also able to take home a bag of goodies which included an Appalachian cookbook, loaf of Amish bread and Amish apple butter. We are already taking recommendations for next year’s breakout session so if you would like to recommend any topics for our sessions please e-mail them to the next year’s co-chairs. Within the next few weeks I will be sending out information about the SSIG Award of Appreciation and the SSIG Award of Excellence. Be thinking about who you want to nominate. Next year the co-chairs will be David Allen from Southern State Community College and Angela Williams from Cleveland State University. On Friday, May 27th 2011, the Technical, Electronic, and Digital Services Interest Group (TEDSIG) hosted its Spring Workshop at OhioNet. The workshop title was Linked Data (LD) and it highlighted three guest speakers. The 22 attendees included a librarian from Michigan and two library students. The first session “What is Linked Data, and What Does It Mean for Libraries?” was led by Emily Nimsakont, Cataloging Librarian at the Nebraska Library Commission. In the first half of her presentation, Emily provided a great overview of basics and principels of LD, she also demonstrated a few LD projects such as Freebase. In the second half, she talked about what LD could mean for libraries and highlighted current projects such as The Library of Congress Authorities and Vocabularies. The second session “Linked Data Activities at OCLC” by Ralph LeVan, Senior Research Scientist at OCLC Inc. Ralph began his presentation with an overview of the LD technical requirements including the construction of RDFs. Then, he talked about specific examples under development at OCLC such as The Virtual International Authority File. The last session Non-Linear Thinking and New Media Literacy by Jared Bendis, Creative Director New Media at Case Western Reserve University. Jared talked about the “ocean of new media” and underlined that one of the key elements in the world of new media is the non-linear nature of its existence and of our exploration of it. The workshop was well accepted, all participants provided positive feedback and suggested new topics for future workshops as well. For those interested in following up on what LD could mean for libraries, the following links may be of interest: The Strongest Link: Libraries and Linked Data, a recent article by Gillian Byrne and Lisa Goddard; and Linked Data Building on Cooperative Relationships, a presentation at the upcoming ALA Annual Conference.